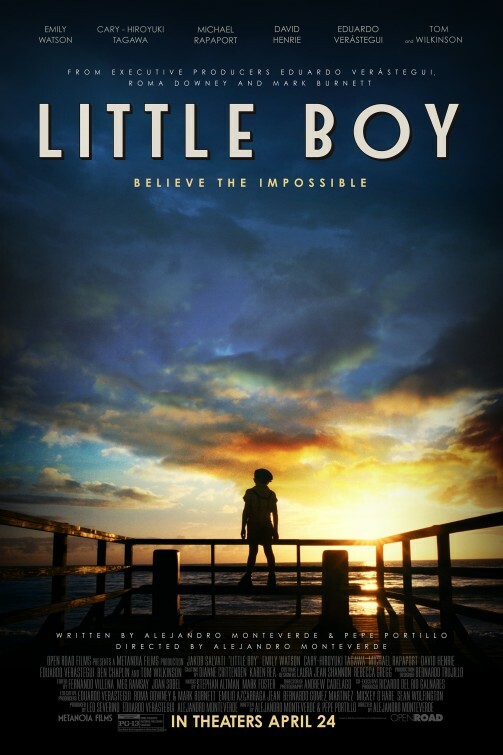 As the title suggests, Little Boy is a film about a little boy. The film is set in the 1940s. Ostracised by the kids around him, this boy named Pepper (Jakob Salvati) finds his best friend in his father (Michael Rapaport). The two continue looking at their life through their fantasies until Pepper’s father enlists in his older son’s place for World War II. Now, Pepper is willing to do anything it takes to bring his father back to him. Even if it is totally beyond his control. On his quest for bringing back his father, pepper meets certain people who influence him in a great manner. His elder brother London (David Henrie) who is filled with hostility towards the Japanese, just like the rest of America during war. London is also raged by the fact that he was declared ineligible for military service because of flat feet and that his father has to fight “his war” for him. After some days when the news of his father being taken as a prisoner of war reaches his family, London loses his mind and takes out his aggression on an old local Japanese guy named Hashimoto (Cary-Hiroyuki Tagawa). Along with Pepper, London attempts to threaten Hashimoto and gets arrested for the same. Pepper finds a hero. Just like the one in his imaginary world. Ben Eagle, the magician (Ben Chaplin). Who shows him a magic trick and moves a bottle. One day in the church, Pepper hears the Bible verse, “Truly I tell you, if you have faith as small as a mustard seed, you can say to this mountain, ‘Move from here to there,’ and it will move” (Mt. 17:20), and goes to the town priest, Father Oliver (Tom Wilkinson) to learn how to use the power of faith. encourages Pepper to befriend Hashimoto (Cary-Hiroyuki Tagawa). And also gives him a checklist that will make his faith stronger. And which will help him get his father back. Hashimoto becomes Pepper’s friend and helps him believe in himself. He tells him the story of a Samurai warriors who fought and saved his country from stronger enemies. Hashimoto argues with the priest that what he is doing will not help in bringing Pepper’s father back. And after Pepper completes the list, if his father does not come back from war, he will lose faith in himself. These characters suggest that the film is also about having a good role model. And also about how through so many adverse thoughts surround the kid, how he makes his own choices and finds his own personal religion. It is a very interesting term, personal religion. It signifies the personal, one on one relationship with an individual and God. No matter what others tell you about God, you will always have your own idea of God. And your ego will govern your relationship with God. Your ego will tell you whether you are acting in a way that God would appreciate or not. The film is about a little boy and The Little Boy. It is an uplifting tale about faith and the power of believing in something. And at the same time, it does a commendable job of staying away from preachiness. In the end, it kept everything quite open to interpretation, making us the little boy and giving us a choice to believe what we want. Most impressively, the film points out that there is little difference between faith and magical thinking. The film is written and directed by Smithsonian Institute Award winning director Alejandro Monteverde. And produced by Mark Burnett and Roma Downey, the husband-and-wife team behind “Son of God.” It earned $6.5 million on a $20 million budget. Which is kind of sad. I watched this film and afterwards like I usually do, I searched for it online. I was stunned. I was amazed to see such negative reviews for a movie of this calibre. And I thought as a person who appreciates cinema should make an attempt to let the makers of this marvel know, that I think the movie is truly brilliant.